Three Castleford Tigers players and one from Featherstone Rovers are set to play in round three of the Rugby League World Cup this weekend. After sitting out the first two matches Mike McMeeken is ready to make his World Cup debut after being named to play in the back row and handed the number 12 shirt for England’s game against France in Perth on Sunday. It will be the second cap for the 23-year-old Basingstoke-born forward after he made his England debut in the mid-season international against Samoa. 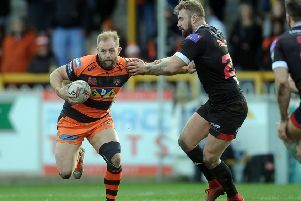 McMeeken’s Tigers team-mate, Luke Gale, has retained his place at scrum-half and will be looking to have more influence on the team than he has in the first two group games. He will have a new half-back partner in Kevin Brown with Gareth Widdop moved to full-back for a game in which England only need to avoid defeat to make it through to the knockout stages of the tournament. They will then likely play Papua New Guinea in the quarter-finals and come up against Castleford new boy Garry Lo, who has been one of the big hits of the World Cup so far with some barnstorming running in his side’s wins over Wales and Ireland. Lo scored a superb try against the Irish, beating six men on an exciting run, and almost added a second when not quite able to ground the ball before the back-line chasing a kick through. He was named man of the match and is showing exactly why Daryl Powell has brought him to Castleford from Sheffield Eagles on a two-year deal. Lo does not lack ambition either as he has admitted to wanting to play in the Australian NRL one day, but first comes the task of making himself a regular with the Tigers and a Super League star and he is flying over on December 8 to join his new team-mates in pre-season. He said: “I’ll play two years at Castleford and then try to move to the NRL. It’s my dream to play in the NRL so I’ll do everything to build my popularity. “Maybe I can finish my career in NRL. Lo has retained his place in the PNG side for their third group game, which is against the USA on Sunday. But Castleford half-back Ben Roberts, who scored a try against Tonga, has been left out of Samoa’s team to take on Scotland in Cairns on Saturday. Former Cas player and current Featherstone back rower Frankie Mariano is down to play in the game as he returns to the Scotland team after being left out for their hammering by New Zealand. The Scots will be looking to restore pride after two heavy defeats so far and then sending three players home for disciplinary reasons. They include Pontefract-born duo Danny Addy and Dale Ferguson an ex-Featherstone centre Ben Hellewell in their side.